Welcome to Custom Mist rental division. We are southern California's premier mist system and misting fan Rental Company. Our commercial misting systems and fans can cool your special event up to 35 degrees and are perfect for keeping your crowd cool at your outdoor event ensuring your guests will remember your event and not the heat. We proudly serve all Southern California and our customer pick-up location is conveniently located in Indio, CA. We also offer delivery service if needed. The Custom Mist, Inc. portable misting fans are the most advanced, durable, and high performance mobile cooling system on the market today. Our portable misting fans are rapidly becoming the mist cooling system of choice for high heat industrial applications, manufacturing and livestock facilities, distribution centers, automotive shops, theme parks, outdoor events, and many more locations where heat is a problem. 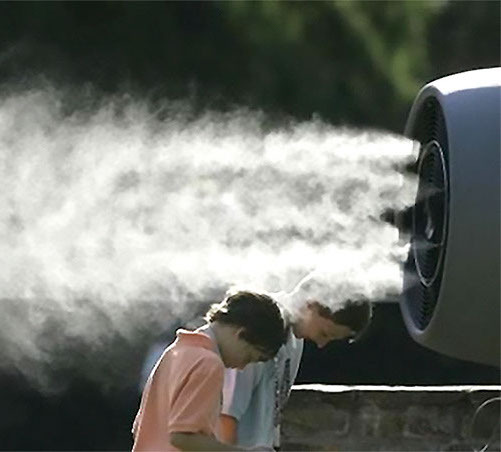 Using flash evaporative misting technology, the sideline misting fans can reduce ambient temperature by up to 35 degrees instantly at a fraction of the cost of conventional air conditioning.